Qnap Expansion Units: Expand Your NAS Up To 760 TB! Does Qnap Gives Free Backup Software? Extended Warranty: How To Extend Your Qnap Warranty 3 More Years? My RAID Should Be 76 TB, But It Seems 64 TB, What Maybe Wrong? Is it Worth to Upgrade RAM on Qnap? Setup Complete, But How Can I Upload My Files? Where Can I Download Qnap 4.1 Firmware? Load Balance Setup: Which Is The Best Port Trunking Option? What Is The Port Number Used By QNAP NAS? And Where Can I Change 443, 8080 Ports? How To Set Port Trunking On Your Qnap Nas To İncrease The Bandwidth Via 802.3ad Protocol. Cannot Access NAS With \\NasName But Can Access Via \\IPAdress. Why? What is Folder Aggregation & How to Use? After Creating ISCSI, How Can I Use? Can I Expand My ISCSI Lun Capacity in Future? 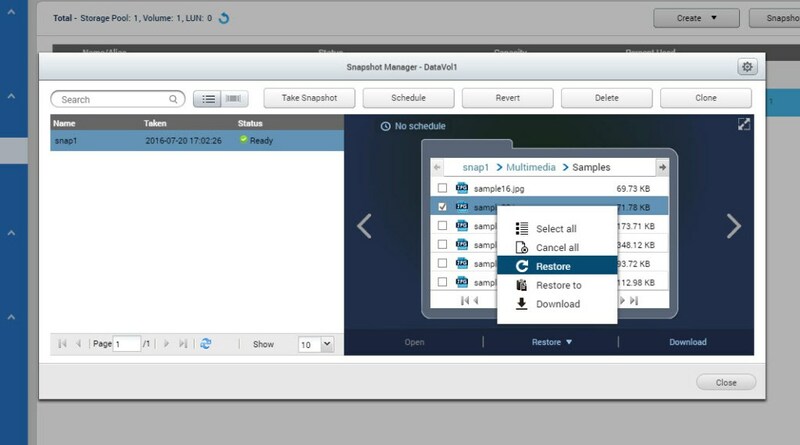 Qnap Virtualization Station Feature: Run Virtual Windows / Centos On Your NAS! Qnap SMB / Cifs Backup Fails To Connect, Even Test Connection Seems Ok? Qnap Snapshot Feature For Cryptolocker Ransomware Attack & Accidently Deleted Files! What’s the difference MyQNAPCloud vs CloudLink? TV Station: Never miss your favorite TV show again! Qnap Unable To Play MKV Files Anymore After Firmware Update And Gives “The Video Does Not Support Online Playback or Does Not Exist” Error? How to Clean Virus on Qnap? How To Setup SMS & Mail Warnings? QSims: OpenSim Metavers on QNAP – Start your 3D WebSim Now! phpMyAdmin Username & Password Doesnt Work! quick.cgi Download On Login Screen Problem & How to Solve? A Hard Disk Drive Error is Shown on the NAS. What Should I do? How To Understant Which HDD Is Broken And Cause Problem In Command Lines? How To Be Sure If Its Qnap Hardware or HDD Issue? The file system is not clean. It is suggested that you run “check disk”. What is Reset Button Function? Qnap Create Temp Files (*.tmp), How Can I Solve This Problem? Qnap Gmail Problem; Why Can I Not Send Notification Emails After Setting A Gmail Account As An Smtp Server? Windows 7 / Windows 10 Backup Cannot Save To A Network Location On NAS, How To Solve! Qnap Reboot Itself Randomly Even There is No Problem on RAID, What Should I Do? Qnapcloud UPnP Router Problem; I Can Access NAS Via Cloudlink, But name.myqnapcloud.com Doestn Work? Enable Trusted Domains Doesnt Work? How To Reinstall To Fix Smb! Want To Check my RAID But md_checker Command Doesnt Work! How Can I Install md_cheker Manually? How to Recover System if You Dont Know HDD RAID Order? iSCSI Targets Get Lost Suddenly, How Can I Restore Them? My ISCSI Luns are not exist under . @iscsi folder? My Qnap is Dead! How to Recover Data? How Add Additional Recording Channels Lisence On NAS & NVR? Ransomware is a cryptovirology attack carried out using covertly installed malware that encrypts the victim’s files and then requests a ransom payment in return for the decryption key that is needed to recover the encrypted files. Wide-ranging attacks involving encryption-based ransomware (also known as locker) began to increase through Trojans in the past few years. This also becomes a rising threat against both business and home users that targets computers and network-based devices. Locker is a file-encrypting ransomware (CryptoLocker, CTB Locker, TeslaCrypt, and others) that encrypts files found on local drives, removable drives, mapped network drives, and even Dropbox mappings. Victims will be extorted a ransom to decrypt the affected files, or they will be unable to open the affect files ever again. A simple yet effective method of mitigating the threat of ransomware is to ensure that you always have backups with versioning. 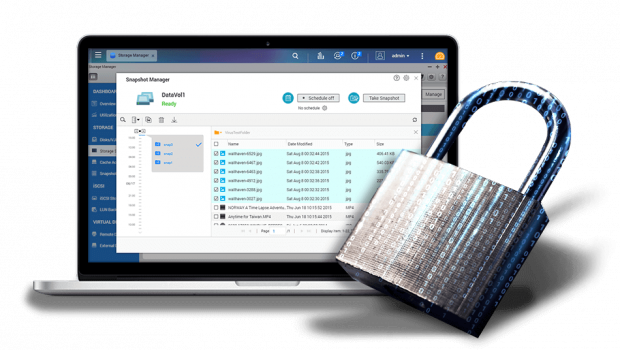 Therefore, I will show you how to protect your data on your QNAP NAS from ransomware by using QNAP’s snapshot feature. 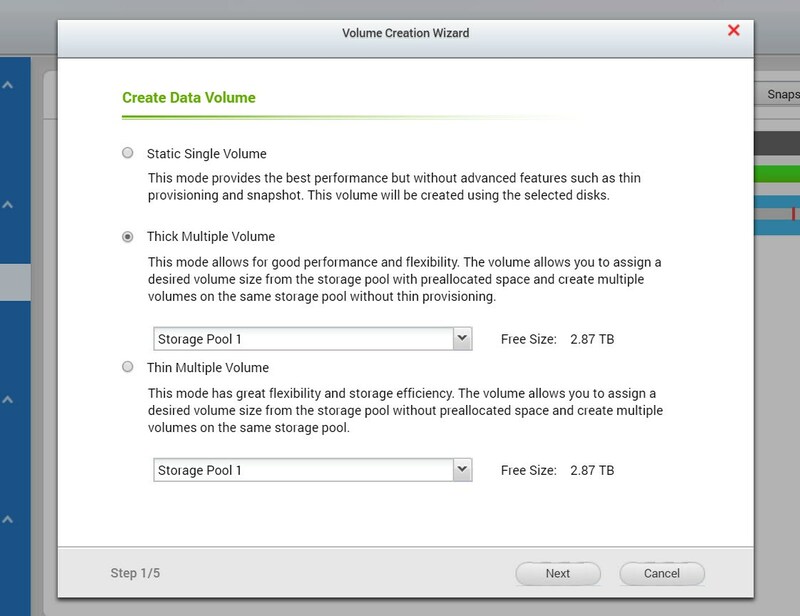 First of all, while creating your storage volume, be sure to choose either “Thick Multiple Volume” or “Thin Multiple Volume” that both support snapshot. 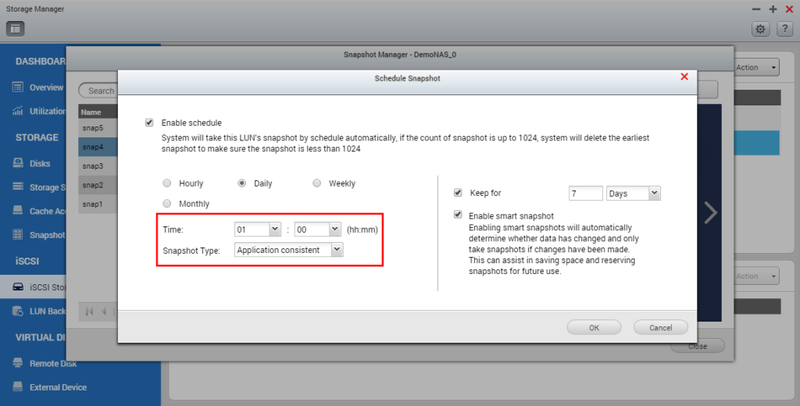 Upon finishing, refer to this tutorial and create a weekly, daily or even hourly snapshot schedule for your NAS. In the event of a ransomware attack and your files are encrypted by ransomware, then you can easily revert the entire storage volume to a previous state which has not been effected by ransomware. Or you can also choose to restore any specific file to a previous version and overwrite the encrypted file. In conclusion, to avoid or minimize the damage from ransomware, it is always important to keep you NAS system up-to-date. In addition, to deploy and maintain a comprehensive backup solution with versioning, and also has the ability to quickly revert to a previous version is as important. One Response to Qnap Snapshot Feature For Cryptolocker Ransomware Attack & Accidently Deleted Files! yaklaşık 3 aydır 431+ modelini kullanıyorum. snapshot özelligini kurabilmem için sıfırdan kurulum mu yapmam gerekiyor. Sıfırdan kurulum yapmadan nasıl aktif hale getirebilirim. +"Qnapcloud UPnP Router Problem; I Can Access NAS Via Cloudlink, But name.myqnapcloud.com Doestn Work?" Document renewed!